5618576 Corporal Henry Cornelius Elliott of the 2nd Battalion, the Devonshire Regiment. Son of Henry and Kathleen Elliott (née Kelly) of Cruwys Morchard. Born in the September Quarter of 1920. Died 26 April 1945 aged 24. 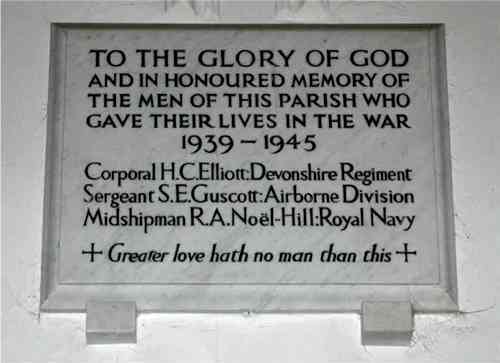 5627376 Sergeant Sidney Elliott Guscott of the 2nd Battalion, the Special Air Service Regiment, A.A.C. Son of Frederick and Molly Guscott of Cruwys Morchard. Born in the June Quarter of 1920. Died 27 March 1945 aged 24. Midshipman Robert Abercrombie Noel-Hill of the Royal Navy, HMS Matabele. Son of Robert and Helen Noel-Hill, of Cruwys Morchard. Died 17 January 1942 aged 18. Commemorated on the Plymouth Naval Memorial. Attended Dartmouth Naval College and awarded the King's Gold Medal and the Robert Roxburgh Prize in December, 1940. H C Elliott used to live at Knapp which was near Morchard Mill. Now derelict, the cottage was allowed to fall down. He had a brother who was also in the army. Sid Guscott's mother, Molly, ran the village stores for many years and his father, Fred, was a carpenter. Sid had a brother, also called Fred, in the army; in later years this Fred Guscott became Mayor of Exeter. The mother of Robert Noel-Hill was called Abercrombie before her marriage. Her family came from Budleigh Salterton.